Maintaining mission readiness, while balancing dual responsibilities as citizens and Soldiers, can present challenges for Army National Guard (ARNG) Soldiers and their families. Enter Guard Your Health, a website dedicated to the unique health and wellness needs and experiences of Army National Guard Soldiers and their families. The website provides a central online hub for the Army National Guard community to find information and resources on health topics and medical readiness. Good oral health is a critical component of readiness to serve. About one in ten ARNG Soldiers are medically non-deployable because of an overdue dental exam or missed dental treatment. In addition to avoidable pain and suffering, dental readiness means being ready and able to support the unit’s mission and, well, getting paid for duty. Guard Your Health supports the #GuardYourSmile initiative, which is dedicated to raising awareness of the importance of good dental health. Content on the website is tailored specifically for Soldiers and their roles in the Army National Guard and civilian communities. Website visitors can access health tips, expert commentary, and articles on topics such as nutrition, exercise, stress, sleep, dental health, behavioral health, readiness, and family resilience. Read articles and tips about health and medical readiness topics important for all aspects of Guard life, whether they are new to the Army National Guard, preparing to mobilize, or reintegrating into civilian life. Search for psychological health coordinators, chaplains, and sexual assault crisis response contacts. Ask anonymous health questions and get timely answers from Guard Your Health’s panel of subject matter experts. The American Academy of Pediatrics is proud to be among the Community Support Network members who provide information and resources to Guard members and their families. When it comes to taking care of your smile, there are plenty of misconceptions out there. But while good oral health can be achieved in just minutes a day, the wrong practices can cause irreversible damage. Here’s what you need to know. Myth: The harder you brush, the cleaner you’ll get your teeth. Myth: Flossing isn’t really necessary anymore. The real deal: The recommendation to floss regularly was recently removed from the government’s Dietary Guidelines for Americans based on a lack of strong evidence for the practice. However, a lack of strong evidence doesn’t necessarily mean that flossing is not effective. 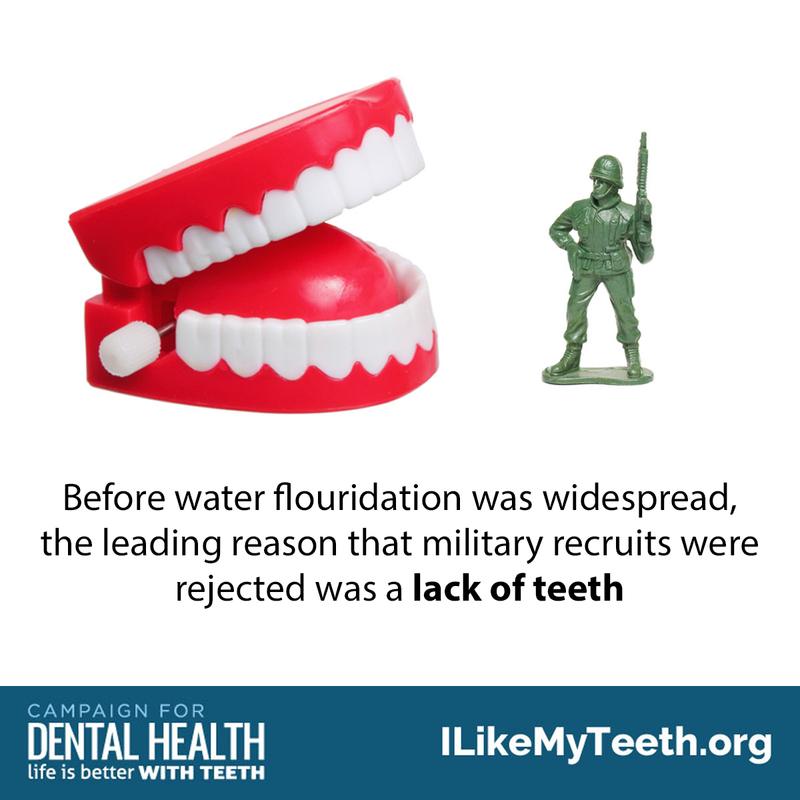 In fact, many dentists — including Dr. Ferraz-Dougherty — haven’t changed their ways or their recommendations. “I totally believe in flossing,” she says. “Intuitively, it makes sense that there is buildup you can only remove by flossing, and I see the difference every day.” It’s important to still follow your dentist’s recommendation on brushing and flossing. But chewing gum still doesn’t replace brushing and flossing when it comes to removing plaque from all the surfaces of your teeth. You should brush at least twice a day for about two minutes, says Ferraz-Dougherty. Myth: If your gums bleed when you floss, it’s best to leave them alone. The real deal: “The reason our gums bleed is due to inflammation,” explains Ferraz-Dougherty. Often it happens when bacteria and plaque get stuck in between our teeth where toothbrush bristles don’t reach properly. Over time the bacteria builds up and causes the gums to become inflamed. Bleeding is part of that process. If you floss once a month (or just before going to the dentist), it’s likely you’ll notice your gums bleeding. “That’s a sign telling you something is going on there,” says Ferraz-Dougherty. Make flossing a daily habit and the inflammation — and the bleeding — will go away with time. Myth: You’ve been slacking on brushing and flossing and have a dentist appointment coming up. As long as you brush well before going in, no one will know, right? The real deal: Sorry to break it to you, but you’re not getting away with anything. “We can tell,” says Ferraz-Dougherty. Without regular brushing and flossing, hard tartar forms around your teeth and at a certain point you can’t get it off with brushing alone. Plus, you can’t undo the inflammation in your gums that occurs when plaque and tartar have accumulated over six months with just a few days of flossing. “Bleeding gums and the amount and location of tartar are the giveaways,” says Ferraz-Dougherty. The real deal: Sensitivity is a key symptom of the loss of enamel, the hard protective layer on the outside of your teeth. But it can be caused by other factors as well, such as gum recession, or even the use of whitening toothpastes. “The hydrogen peroxide [used for whitening] can penetrate to remove stains,” Ferraz-Dougherty says, “And it penetrates through the enamel into the layer beneath, which is the more sensitive part of the tooth.” The good news: If your sensitivity is caused by teeth whitening, switching to a more gentle toothpaste can help improve symptoms. The real deal: Your dentist might be the first one to notice it, but if you have gum disease you’re more likely to have health issues such as diabetes and hypertension, as well as certain types of cancers that are related to chronic inflammation, says Ferraz-Dougherty. The real deal: This can be true but not always. “Our teeth are naturally white,” says Ferraz-Dougherty. And many of the things that cause our teeth to get darker or become yellow are unhealthy, like smoking. But there are also plenty of things that can darken the color of our teeth that aren’t necessarily unhealthy, such as medication, stains from foods and drinks, or just the natural process of aging. The real deal: “This is one of the biggest misconceptions,” says Ferraz-Dougherty. “With a lot of dental issues, you don’t necessarily feel pain right away. I have to explain to patients and educate them that with cavities and gum disease you don’t always feel it.” The problem is once the symptoms appear, it’s often a bigger issue. If you wait until a cavity hurts to get it checked out, you could end up needing a root canal or an extraction that could have been prevented with regular checkups. When you’re busy with tests, essay deadlines and a hectic social life, it’s easy to forget all of the dental tips that you learned when you were a child. Keep the following dental tips in mind to maximize your oral health easily and effectively. When you’re out at a bar or a party, remember that some drinks are more likely to cause tooth decay or staining. Top dental tips include drinking fewer sugary cocktails or alcopops, and swapping your red wine for white wine if you want to keep a bright, attractive smile. If you’re looking for whiter teeth, one of the smartest dental tips is to go to your dentist’s office instead of buying a cheap product from the mall. Some of these products can damage tooth enamel when used excessively. Although you might want a tongue or lip piercing for aesthetic reasons, one of our dental tips is to avoid these piercing. They commonly result in chipped teeth, and they also increase your chances of getting a painful infection. Dental checkups are as important now as they were when you were a child, so one of the most useful dental tips is to see your dentist at least every six months. Although you may not think there is anything wrong with your mouth, your dentist can spot the early signs of problems like tooth decay and gum disease before they get more serious. When you’re stressed, you’re more likely to grind your teeth, and this can not only cause tooth damage but also lead to intense pain in your jaw. One of our top dental tips is to make sure you relax before bed. In addition, make sure that you take breaks when studying. Veneers are thin porcelain sheets that are bonded to your teeth to enhance the appearance of your smile. Getting veneers in Chicago is a popular option for those whose teeth are deeply stained and resistant to bleaching. If some of your teeth can be whitened but others are naturally too thin or have become more grey in color, then adding porcelain veneers in Chicago to these teeth can help create a cohesive-white smile. Zoom! Teeth whitening is the best option for those who wish to brighten their smile very quickly with proven results. The efficient process can whiten teeth up to 8 shades whiter than their original color. Zoom! teeth whitening is unique due to the ultraviolet light used to enhance results with the whitening gel. Another advantage of Zoom! teeth whitening is it is less likely to cause tooth sensitivity. At home products, such as custom-fit bleaching trays, can give you similar results as Zoom! teeth whitening. However, bleaching trays take a much longer period of time to see results as good as Zoom! Teeth Whitening. It also takes much more maintenance and upkeep. For expectant mothers it is quite normal to be concerned about their own general and oral health. Could pregnancy affect my gums? (Yes, gingivitis, inflammation of the gum tissue is common from the second through the eighth month of pregnancy.) Does the calcium for the baby’s teeth come from my teeth? (No, this is an old wives’ tale!) These are just a few of the questions covered in this response to a Dear Doctor email from an expectant mother.